I'm sitting here watching Star Wars with my youngest son, and trying to think of a way that it relates to this book on the dynamics of men who fight for their country and those they leave behind, all woven within the melodious sounds of trumpets blaring and lasers blasting. Nothing inspires war like a rousing soundtrack. 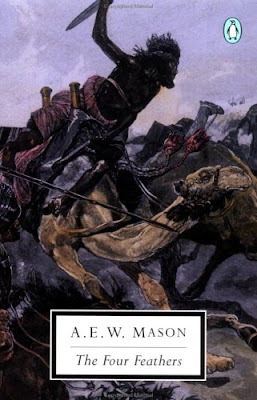 I thought this book would be about England in the 18th and 19th century and their quest to dominate Africa and the surrounding countries, but truly it was hardly about war at all. Not war itself anyway, but the effects of war on its soldiers and their loved ones. Harry Feversham is the child of many glorious war heroes. Much is expected of him when he joins the British Army, but when actual war in Africa is imminent, the newly engaged Harry opts out to relieve his fiance from having to be without him for several years, and because basically, he believes himself unequal to the task. In a nutshell: He's afraid. Three of his Army friends find this unacceptable and they answer his resignation with the universal symbols of cowardice: three white feathers. His fiance Ethne, upon finding out he has resigned from the Army, breaks off their engagement and gives him the fourth feather. Harry is crushed, and upon his shame reaching its pinnacle he makes a decision: He means to redeem himself and restore his honor by saving the life of his three friends who are currently serving in Africa. I haven't mentioned a fourth friend, Captain Jack Durrance. On the sidelines he is Harry's greatest ally and also in love with his fiance, Ethne. 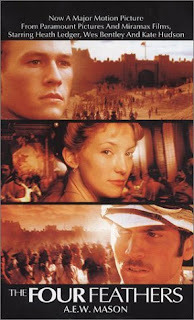 Unlike the recent movie version with Heath Ledger remaining the hero throughout, the bulk of the actual story is from the point of view of Captain Durrance who has no idea why Harry has resigned, nor that anyone has accused him of being a coward as he is steadfastly defending England's interests in the Sudan until he becomes permanently injured and must return home where he and Ethne reunite. While recovering from his injury, he begins to piece together what has happened to Harry who seems to have disappeared, and with the help of some of Harry's remaining friends, makes a steadfast resolve to hear news of him in Africa and help him however possible from England. This book, in all actuality, is about sacrifice. Durrance's physical sacrifice for the country of his birth, as well as giving up the woman he loves for his best friend. Harry's sacrifice of giving up six years of his life for Ethne and the three friends he feels he must prove his worth to. It is also about honor in war. There once was a time, probably up until the end of WWII, that service to one's country was of paramount importance. If you did not jump at the chance to live, and die, at your nation's defense, you were looked down upon. Not just in England. I would say here in America too. Having seen the pictures of the lines of people cheering along homeward bound railways, being at war was a national effort, a means of pride and ownership of the task at hand. Does it seems that way now to you? Here in America, serving in the military is no longer a requirement, and if you chose not to do it, no one really cares. Why is that I wonder. Are we different as a nation? As a world population? The answer is obvious. Yes. We are a different generation, who up until recently haven't had to give up much for our country, and it shows. Even Star Wars isn't just about war between the Alliance and the Empire, or how cute Han Solo is, or Princess Leia's cinnabon hair (although that stuff is important!). It's about people. It's about what friends will do for each other in a time of crisis. Even that show is about honor. No matter what we do, we can't quite get away from it. Do we want to? "Here in America, serving in the military is no longer a requirement...". i may be wrong, but i don't think it was ever a requirement. the US Armed Services historically relied on recruitment, and when that wasn't enough, they used the Draft. "There once was a time, probably up until the end of WWII, that service to one's country was of paramount importance". WW2 was an easy cause to enlist for - naked, unprovoked aggression against our Navy at Pearl Harbor, with more than a thousand US lives lost. Before Pearl Harbor happened, the US wasn't in any big hurry to enter WW2. I was referring to the draft the first time, on the second I meant, and was thinking of my grandfather who fought in WWI, about his attitude about signing up for that war. It's just what kids his age did. It was expected. Or at least that's what he said. When we were at war, people signed up, and then sometime in between WWII and Vietnam, they had to install a draft because they didn't have enough recruits. I'm just wondering what caused that. People got smarter? The general attitude of the 60's? What do you think? anti-German feelings ran strong here in the days before WW1, so your grandfather's sentiment is probably mainstream. the question can be asked whether British Intelligence manipulated this by giving us the phony Zimmermann Telegram. its harder to give a reason worth dying for when it comes to Vietnam. they didn't bomb our Navy base or threaten to invade us. were we stopping the flow of Communism? apparently not. letting Freedom ring? nope, the South Vietnamese regimes were oppressive, and the population was by the large on the side of the Viet Cong. but you're right - the most important thing is that America changed. we're better educated now, and less likely to blindly follow some politician's whims. there are enough volunteers - either out of duty or for the money - to fill the military ranks. which is a good thing, because the US populace won't stand for reinstating the draft for questionable causes like Iraq and Afghanistan. I haven't read this and you've caught my attention when you said: "Not war itself anyway, but the effects of war on its soldiers and their loved ones." Personally, as far as sacrifice and honor is concerned, I have a lot to learn there and this book sounds like it would make you think about those topics not to mention being afraid too. I'm generally not a fan of our current war debacle that we're in, so reading this book was good for me to get a different point of view.